United States Postal Services testing new air horn in Phoenix to prevent dog attacks. PHOENIX — It may just be a simple air horn, but this is the United States Postal Services latest weapon against dog attacks. In 2018 the USPS reported 5,714 dog attacks on postal employees nation wide; 73 in Arizona and New Mexico and 24 in Phoenix. 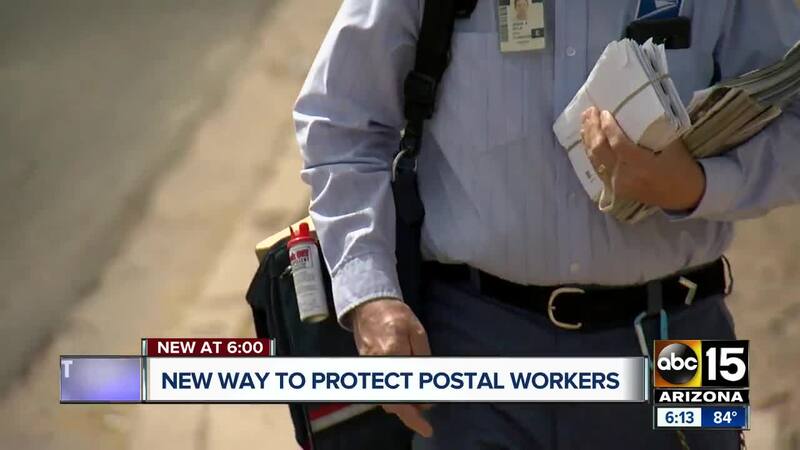 Alfredo Villa, a USPS carrier in Phoenix for 31 years will tell you, "If it's got teeth, it bites." The USPS recognizes that not all dogs are vicious but acknowledges their carriers encounter dogs on just about every block of their routes. Currently, carriers have a can of dog spray and their carrier satchel, which is also used as a line of defense. The air horn being tested in Phoenix enters the mix as an extra method of defense. It allows the carrier to be far enough away and scare the animal off at the same time. "Especially the larger dogs, they perk up, and they don't like the sound, the small dogs have a tendency to stop and try to wonder what it is," said Villa. So far the air horn has received positive remarks from carriers, although there is no word on if or when the USPS will provide every carrier with an air horn.